The International Criminal Court has issued indictments against Libyan dictator Muammar Qaddafi, his son Saif al-Islam, and the head of the secret police. This move is a great good thing, and combines with an increasing conviction among close observers that the regime’s time in Libya is coming to a slow, inexorable close. Free Libya forces in the Western Mountain region have pushed to within 80 miles of the capital, Tripoli, and are engaged in fierce fighting for the town of B’ir Ghanem, which lies some 25 miles beyond their previous front. Chris Stephen argues that the indictment of Qaddafi and his son by the International Criminal Court makes a negotiated settlement of the Libyan crisis all but impossible. All negotiators can any longer offer Qaddafi if he steps down is a jail cell. But let us face it, Qaddafi is not all there and is extremely stubborn and narcissistic, and it is highly unlikely that he would have stepped down under any circumstances, anyway. In that light, the ICC indictment helps the situation because it signals that there will be no return to the status quo ante. Europe is no longer a playground for the spoiled Qaddafi boys. Qaddafi can no longer go on state visits or host politicians at his chalets on the continent. Even for politicians to take money from him and be closely associated with him may become difficult, lest they be looked at as accomplices. 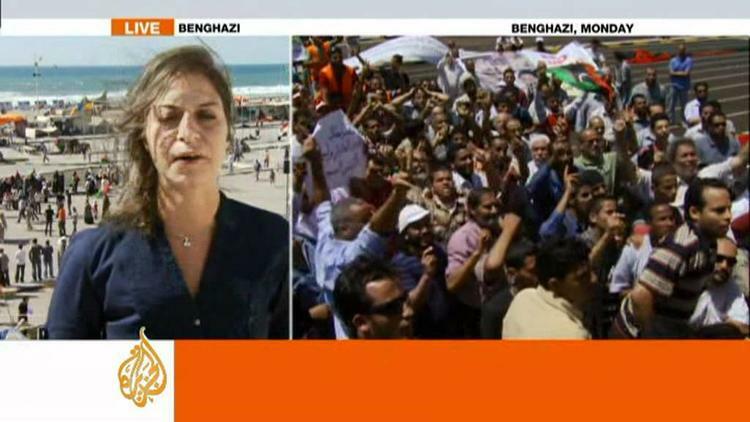 Aljazeera also reports on the slow advances of Free Libya forces in the contested West of the country. Somewhat to the east, NATO continued to soften up Qaddafi’s defenses in the oil-rich town of Brega, a key to the Brega Basin, which has much of Libya’s oil wealth.